This is the article I wouldn’t want ever to write but, unfortunately, there will always be criminals abusing defenseless and innocent creatures. ASGER JUHL, A PRESENTER ON DANISH STATION RADIO24SYV, BEAT THE NINE-WEEK-OLD FLUFFY BLACK RABBIT, NAMED ALLAN, TO DEATH LIVE ON AIR WITH A BICYCLE PUMP, despite protests from animal rights campaigners in the studio. Then he took the animal home where he and his children cooked and ate it. Certainly, many animal rights activists will remember that in DENMARK also, a giraffe and then four lions were killed in COPENHAGEN ZOO in 2014. BENGT HOLST, the Scientific Director at Copenhagen Zoo, defended the killings by claiming that the animals were “surplus”. Copenhagen citizens awarded “CITIZEN OF THE YEAR” to Holst that same year. Radio Host Clubbed A Rabbit With A Bicycle Pump While He Was On Air For Rating! Demand Punishment! Fire radio presenter Asger Juhl who killed ‘Allan’ the rabbit live on air and the managing director of Radio24syc Jorgen Ramskov who sanctioned the kill. Please boycott the radio station and ASGER JUHL’s program. 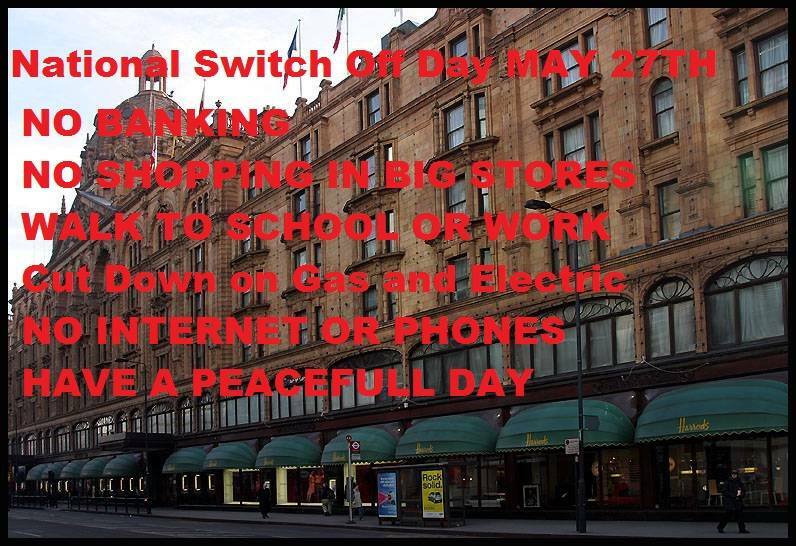 May 27th is the state opening of parliament and the first national switch off day. This is something almost everyone can do, which could be highly effective if enough of us take part. We need to show this government that enough is enough. Between 4 pm on Tuesday 26th to 4 pm on Wednesday 27th use as little gas and electricity as possible. Some people have said they will turn off their freezers and fridges. Personally I have ethical considerations about deliberately wasting food – frozen food would of course need to be thrown away as would perishables in the fridge. Considering this I personally think that you should leave freezers and fridges turned on. It is proposed that a switch off day should happen each month, it simply would not be practical to throw food away each time. And most certainly please do not put your health at risk, don’t turn off your fridge or freezer if you need to keep medicine refrigerated or you need electricity or gas as a medical necessity. Also our gas boiler cannot be turned off without the risk of damage but if you don’t use hot water or your central heating very little electricity is used. Just do what you can but try to use as little energy as possible. Please share this and other protests far and wide. If this isn’t for you for some reason there are many other ways of protesting such as boycotting Warburtons who fund the Tories, more information about this and for more ideas including details of protest March’s and demonstrations please scroll down further. “NATIONAL SWITCH OFF DAY. No 1 The day MPs are officially sworn in. The only language government understands is money. If we come together and switch off our gas and electric and not give a penny to any large corporation (please support local shops), it would cost them millions of pounds. Nothing wrong with traditional protests on the streets but the government wants it that way so they can fight back with their water cannons etc. They won’t know what’s hit them if we all stayed at home or visited a local park for the day. Nothing whatsoever they could do about it. Whatever your reasons for wanting to protest. Be it fox hunting. The NHS. Austerity. Benefit cuts. Fracking. The continued child abuse cover-up. Whatever. Let’s unite under one banner for one day. And hit them where it hurts, in their pockets. Love to you all. Not mentioned in the description but is part of the action and that is you should also avoid buying anything, except from a local independent shop. You should boycott supermarkets such as Tesco, Asda Sainsburys, Morrisons or other large national retailers. 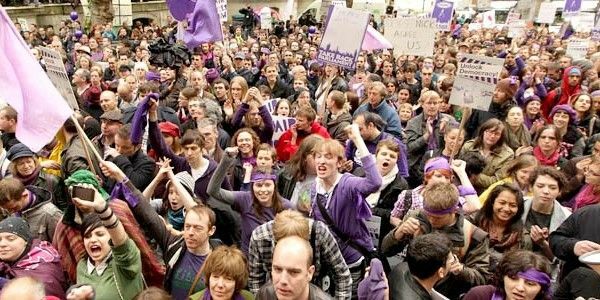 Join a protest on the 27th – I urge you to please demonstrate peacefully. “Just how much of your money goes on funding a political party you would rather not support? 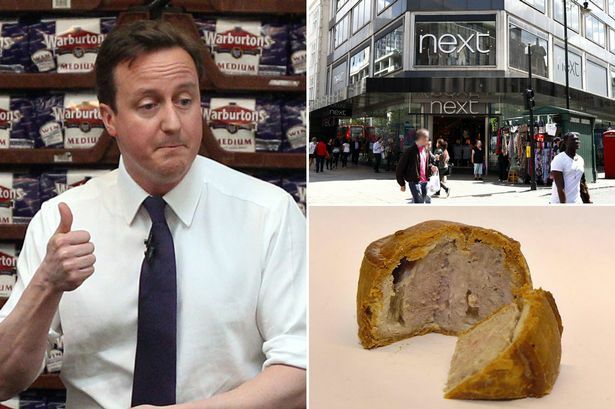 We looked into the donors to the Conservative Party, and pulled out the well-known brands and products where shareholders of the company – or the company itself – has donated to the Tories. Please write an e-mail (contact form) or letter and tell them why you are boycotting their product. Please do likewise with the others mentioned on the Mirror’s list by simply entering their name in the search engine using the above as an example : Warbartons contact details. Though the dust seems to be settling and people seem less outraged the fact is our general election was a disaster for those of us who are poor or have the misfortune to be sick and disabled, unemployed or on low wages or zero hours. I hope that none of us who are opposed to this vile government become complacent and accepting, though I fear this could happen. I have more comments further down but if you do not have time please at least sign the following petitions and make note of upcoming protests for the coming weekend and the following week. Even if you cannot join in the protests please spread the word. In the current UK system, anti-austerity party The Green Party got 3.8% of the votes and only one seat out of 650 in Parliament (0.15% of seats). In PR, they would have got the equivalent of 25 seats, giving them significantly more power in Parliament to represent voters’ views. They’d likely get even more because people would have no need to do ‘tactical voting’ — where people vote for a less preferred party because it has more chance of getting a seat in the current system. Many of us are still asking the question: what happened last week (May th) Opinion polls predicted a very different election result — but the reason the polls misjudged this so severely is because we have an electoral system that simply isn’t fit for purpose. The First Past the Post system is broken and needs to be replaced. Politics is no longer a choice between two candidates, we need a system that proportionally represents the wide range of views that are now on offer. Please support this petition for a fairer and more proportional voting system. Together we can force the agenda on electoral reform. Demonstrations and protests planned for the weekend and next week. Midday Sat 23rd at the Coffee Box Cafe in Leamington. Over the next five years we are facing £30 billion of cuts and austerity. We need to support each other against the impact of the cuts and organise resistance to them on a long term, local basis. On Wednesday 27th May it will be the state opening of Parliament, where the Tories will officially form a Government. They will do so with just 37% of the vote, and with the consent of 24% of eligible voters in the UK. The new Government is going to try to: smash the welfare state by £12bn, privatise the NHS, raise tuition fees, decimate local services, make strike action illegal, scapegoat migrants, worsen the housing crisis and to crush all dissent that stands in their way. I am at a loss to understand not to mention angry so angry concerning the outcome of the general election, how can people be so stupid as to re-elect this evil – yes not to strong a word – government who have made the lives of sick and disabled people and the unemployed a misery, to name just a few of the many sections of our society who have been subject to the detrimental policies of the Tories. Many people have died of starvation and committed suicide as a result of welfare reforms, many others are homeless, on low wages, zero hours and… lets not forget the threat to our NHS of privatisation which no one wants. Yet despite all this people voted for them again! Or did they? Well of course some people did but not the majority of us by any means. The fact, as many of us know, is that the majority did not vote Tory, the reality is that only 36.9% of the population who voted, voted conservative. Labor made bigger vote gains, but lost seats. The Conservative Party increased its vote by 0.8%, but increased its number of seats by 28 seats. The Labour Party increased its vote by a greater percentage than the Conservatives did, 1.5%, but its number of seats decreased by 24. Most voters cast their votes for defeated candidates, so most are “represented” by an MP they did not support. Some parties are over-represented in the House of Commons relative to their support among voters. So the governing Conservatives, with 36.9% support, have 50.9% of the seats, and the Scottish Nationalists, with 4.7% support, have 8.6% of the seats. Other parties are grossly under-represented, most notably the United Kingdom Independence Party (UKIP) with just one seat, yet 12.6% support. The percentage swing to UKIP was the biggest for any party in the UK for at least a generation, but the 3,881,129 people who voted for them – the third-biggest vote after the Conservative and Labour parties – are almost all unrepresented in the House of Commons now. I have to say that I am concerned about the rise in UKIP voters this unsavory racist right-wing party are little better than fascists. This is the only downside to representational voting as the number of seats won by UKIP would rise from just one to 38 seats, disconcerting to say the least. However the Greens would have gone from one seat to 24. And the Tories would be 75 seats less though still have the largest party in the commons. In the end though the Conservatives would still have the majority but not the power that they have now. It appears to me that there are times when democracy does not work for social justice, equality and fairness. Just because the majority want something doesn’t make it right. For example most people would say yes to the return of capital punishment, a barbarity that was consigned to our history back in the sixties where it should remain. Might is not always right and neither is the consensus, even if there was a consensus. The fact remains many people voted Tory for all sorts of reasons ranging from sheer stupidly, to self-interest. Many people voted UKIP because they fixated on immigration without thinking of the broader issues such as UKIPs intentions of privatising our NHS and replacing it with an insurances based service similar to the USA. – Charlotte Church expresses many opinions similar to my own and to many people who were shocked by the election results. Personally I rather think in addition to the obvious greed of the wealthy who voted Tory, ignorance and gullibility were among the factors people voted for the conservatives. Reading the comments in the above Mirror article is nothing short of depressing. Ignorance it seems reigns supreme. To say the election was lost as a result of left-wing politics by labour is misguided to say the least. The reality is that Labour did not lean far enough to the left. 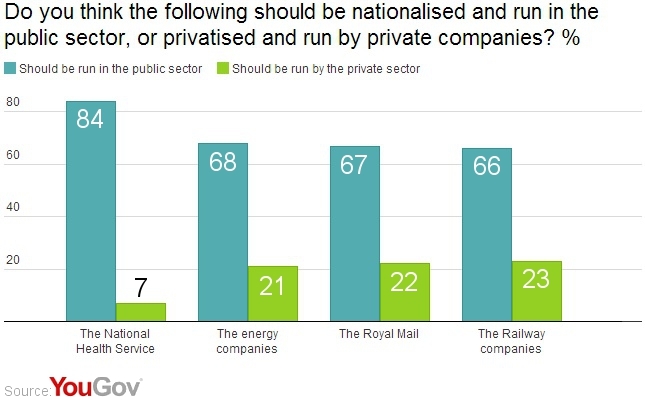 For example the majority of people, 68 percent would like to see the energy companies renationalised. The promise of freezing energy bills was lame and didn’t really address the problem of huge energy bills which right now prior to any freeze are astronomical and for many unaffordable. The fact is Labour are now almost as right-wing as the conservatives. Yet all Labour had to offer was a temporary price freeze to tariffs that are already too expensive for many people – not really socialism is it. I have to ask myself why the hell the British people, disgruntled – and that is putting it mildly – with the right-wing political agendas of the coalition than go and vote for the Tories Rather like throwing more fuel on the fire. I am extremely disturbed as I rather have the impression that few people really understand or even know about the polices of this right party or even understand the difference between left and right-wing, communism and socialism. The nick name for Ed Miliband, Red Ed, being an example of such ignorance. On the simplest level surely one has to ask how on earth can a millionaire be a socialist. It is also obvious that there is nothing very red/ socialist about the new Labour Party either, yet still people refer to them as socialist even communists as a form of disparagement, not only misunderstanding the difference between right and left politics and ideology but failing to see the disastrous and unfair political ideology of right-wing agendas which favour inequality and the benefits of the wealthy over those of the poor. People continue not to make the connection with the rise of right-wing influence and the dominance of capitalism as the root cause of the suffering and misery inflicted on most of us in varying degrees, other animals and the environment itself. Sadly Socialism and communism have become dirty words for many people who really don’t have any understanding of these political ideologies. Communism is often confused with totalitarianism and or fascism and socialism is confused with communism often used synonymously. Please sign the following petitions for electoral reform if you have not already done so. We must expect an attempt very soon by the Tory government to repeal the fox-hunting bill, as it seems these over privileges psychopaths are desperate to resume their sadistic pastime despite the majority of the public being against its reinstatement. The Repeal of the Hunting Act also means a return of hare coursing & hunting hares with dogs. There should be no place in a modern society for setting dogs onto helpless animals for pleasure. To make matters worse it has been reported that the Scottish National Party SNP may abstain from voting as this is not a Scottish issue the ban already being in place there. 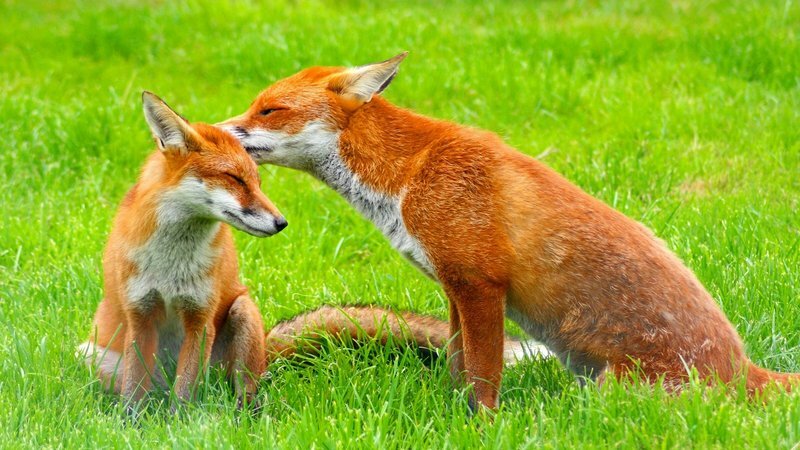 David Cameron: For Foxes’ Sake: Don’t Repeal The Fox Hunting Act! Both petitions may be signed by anyone worldwide. Also a petition by 38degrees. I am not sure if this petition can be signed by anyone worldwide as some 38 degree petitions are only open to UK residents. However it is worth just filling in the details and see what happens. Scroll down for more actions you can take to prevent the reinstatement of fox hunting such as writing to MPs including SNP’s and first minister Nicola Sturgeon. Please ask that SNP MPs take part in the vote and vote against the repeal of the fox hunting act. Please write or email your MP today and ask him or her to support the ban – contact details further down. With the shocking news the conservatives reelection – shocking at least to those who care about things other than the acquisition of wealth at the expense of other people, other animals and the environment – there is now a real threat that our countryside will be the playground once again for the sociopathic few in our society who enjoy chasing a defenseless animal with a pack of dogs and watch the poor creature being torn apart. Cameron’s reelection promise to reinstate fox hunting is imminent and may take place in a few months time. We must take action to stop this barbarity not worthy of any modern-day society, not worthy of the UK which supposedly is a nation of animal lovers. Shocking that a few in our country, but not the majority, voted to have both foxes and Badgers killed – fox hunting and hare coursing are of course not the only attack on your wildlife on the Tory agenda but the massacre of badgers ( Cull/killing) will now continue as promised prior to the election. Yes that’s right if you voted Tory you will be responsible for the return of the atrocity of fox hunting and the continuation of the badger cull, not forgetting of course the impending £12 billion welfare cuts to vulnerable people, the privatisation of the NHS and the scrapping of the human rights act. More about these in another blog entry. http://www.mirror.co.uk/news/uk-news/fox-hunting-back-agenda-says-5665629#rlabs=1 – note the poll which shows that 80 percent of people want fox hunting to remain banned. This not only shows you what a cruel and sadistic individual Cameron is but also how he does not respect democracy or the will of the people but pushes on with what appears to be a fixation of his, this fact is apparent if you read the following article written by Cameron back in 2002 which shows what an unbalanced and despicable person he really is. Read the disturbing remarks made by then MP, now unfortunately Prime Minister, David Cameron in the Guardian Newspaper. “Sitting in parliament involves hours of listening to opinions with which you profoundly disagree. I am usually able to do this without shouting, but as soon as I hear Labour members calling for hunting to be banned, I completely lose it. http://www.theguardian.com/politics/2002/mar/22/davidcameron.politicalcolumnists – Yes I have mentioned this article on many occasions as it offers great insight into the kind of person Cameron is. Fox hunting, hare coursing and hunting hares with dogs is cruel; it is barbaric and has no place in any modern society. Frankly any hunting is abhorrent and should be banned, but for now we have to fight for the progress we have made and not allow the Torys to reinstate this cruel “sport”. Fox hunting should be banned permanently and consigned to history where it belongs. The majority of the British public do not want the ban lifted, it is undemocratic for the government to consider its reinstatement. In the run up to the commons vote to lift the ban on fox hunting I will post as many petitions, notifications of demonstrations and other actions as I come across them. In the meantime please sign the following petitions one of which has been a round awhile but is still relevant of course. As you will see after signing the avaaz petition people continue to sign every minute. The Change org petition needs even more signatures than it has at present. Please sign and share all petitions widely. Please Sign the following petitions if you have not already signed them and send letters and e-mails to your MP and David Cameron. Also consider writing to Nicola Sturgeon and other SNP MPs asking that they vote on the bill and vote not to repeal the fox hunting act. You can write to your MP and tell him or her why you oppose lifting the ban on fox hunting. Letters or e-mail but please try and send send a letter if possible though e-mail if this is easier. Letters can get noticed more but this depends on your MP as does any response you may get. Also tweet them and leave a message on their Facebook page if they have one. Don’t forget to also write to Cameron and let him know politely but in no uncertain terms what you think of his plans to bring back fox hunting. http://news.sky.com/story/1485688/hunting-vote-could-be-just-months-away – so its well worth writing to Nicola Sturgeon and SNP MPs to encourage them to vote. All the first ministers contact details can be found by clicking the link below including postal and e-mail addresses, an online form, telephone numbers and links to her Twitter and Facebook pages. There are many ways you can contact the first minister. Please take as much action as you can. “Supporters of hunting with dogs are confident of overturning the ban imposed 10 years ago, claiming that a majority of MPs in the new House of Commons will vote to lift it. The Countryside Alliance calculates that only about 12 of the 330 Conservative MPs will vote to keep the ban imposed by the Blair Government. However, the rival League Against Cruel Sports is also lobbying MPs and is confident that more than 12 Tories will vote to maintain the ban. It believes it can win the critical vote, which could be very close. It accused the Countryside Alliance of trying to bounce Tory MPs into believing a decision to repeal the Hunting Act 2004 is inevitable, when it is not. http://www.independent.co.uk/news/uk/politics/hunting-ban-set-to-be-repealed-within-12-months-with-early-commons-vote-expected-10254419.html – I don’t give a damn about what the majority of MPs want, it’s not about them is it, it’s about democracy, they know perfectly well that the majority of us oppose the repeal of the ban. They are supposed to represent us not their own self serving agendas. Really it is just so sickening that in a modern society there are people think it is perfectly okay to murder members of other species just for fun! 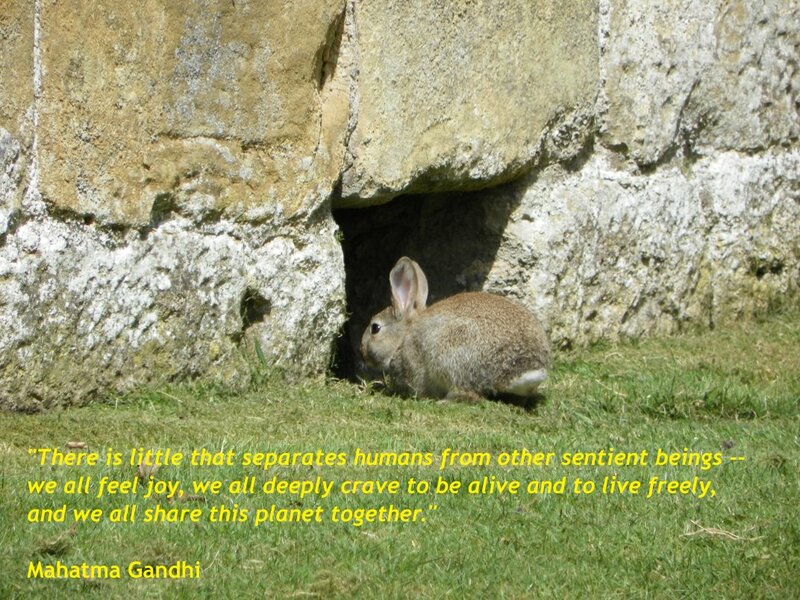 It is cruel, unethical and barbaric and it has to stop. 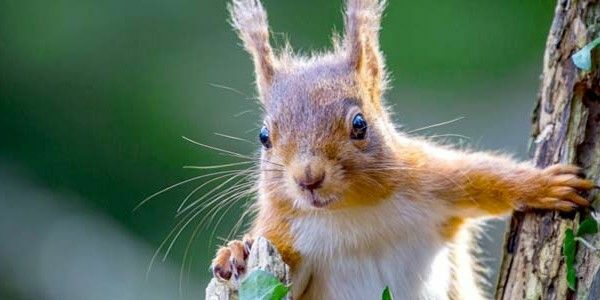 Please sign the following petition to tell the Scottish Government to stop the Scottish Forestry Commission from destroying squirrel habitat! Demand that Loch Ness red squirrels are saved from destruction. “Red squirrels are endangered in the United Kingdom and are a protected animal. Their forest habitat must be protected or they will not survive. 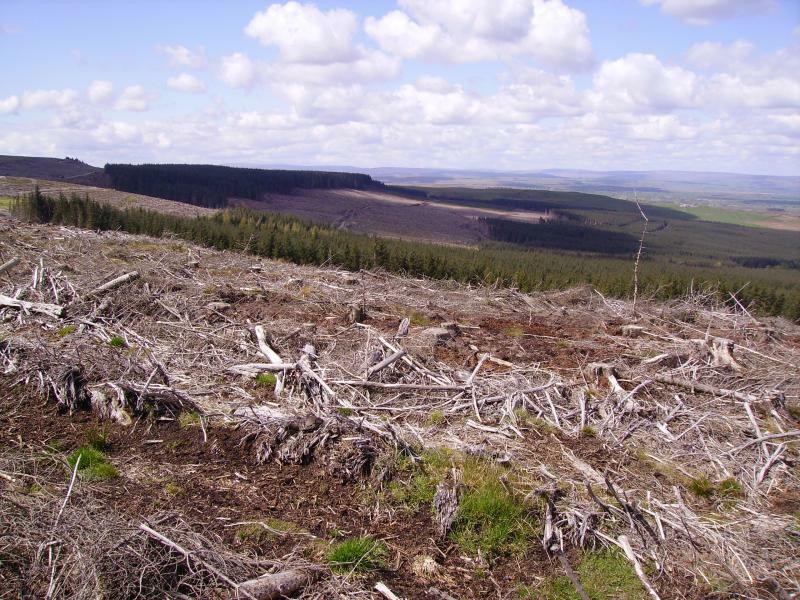 The Scottish Forestry Commission have brought forward their plans for more clear felling in Invermoriston by 20 years, and we are asking that they leave a forest corridor for the red squirrels so that they don’t die. Squirrels are not the only creatures under threat as a result of the Forestry Commission’s dubious plans. The destruction of forests displaces others animals, destroys their habitats, their right to live in this world free from interference by man. The Stang Forest was privatised back in 2011 before the coalition abandoned their plans to privatize our forests as a result of public pressure. 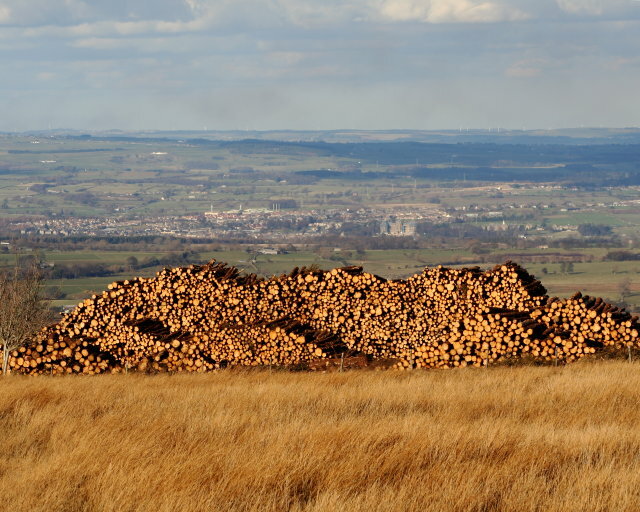 “AS protests over the privatisation of the region’s woodland grows, The Northern Echo can reveal that one 526- hectare forest has been sold to a consultancy company. “The Stang is one of many post-war conifer plantations in the region, but about nine years ago the Forestry Commission launched a 50-year project to encourage a wider variety of trees to grow in the forest. http://www.thenorthernecho.co.uk/news/8833856.Consultancy_company_buys_our_woodland/ – at the rate logging is progressing it is unlikely there will be any Forest left in fifty years time or even the next decade! The new owners promised it would remain accessible. All well and good if there is any forest left after it has been decimated by logging in the past four years without seemingly much effort to replace the cut down trees. Maybe an impressive view but what about the thousands of wild creatures displaced including deer and the pleasure of walking in this forest for locals and visitors alike. Indeed vast swaths of this forest have been hacked down and logging continues on a scale more massive than that which previously occurred. In other regions of Co Durham other small forests have been cut down with no regard for the wildlife that inhabits them. Be on the alert for any UK government plans to sell off our forests. A different issue you may think but reading the article below and looking at the photographs above it isn’t is it. With privatisation comes even more devastation to our forests and death for our wildlife. Until privatisation relatively few trees had been cut down in the Stang Forest now whole sections lay bear. Despite the shelving of plans as a result of public pressure to privatise our forests the threat remains, more so after the Tory majority. Prior to the election the Lib/Dems had plans to put forests into trust to avoid privatisation. Lib Dems suggest putting forests in trusts to avoid privatisation, so it is likely that privatisation of our forests is on the agenda. Even with those forests left under the care of the Forestry Commission there remains a threat of private involvement to the detriment of wildlife and local people such was the case of Fineshade Woods in Northamptonshire. “Forest Holidays, a joint venture with the Forestry Commission, wants to build the holiday cabins at Fineshade Woods, near Corby. http://www.northantstelegraph.co.uk/news/top-stories/fineshade-woods-cabins-will-be-a-money-spinner-1-6062432 – note in this article the usual promise of jobs and a boost to the ecconomy in order to justify building at Fineshade woods. While it appears that the threat has passed for Fineshade woods we must remain vigilant to prevent the privatisation of our forests. 38 degrees forest campaign http://blog.38degrees.org.uk/tag/save-our-forests/ Apparently there was a second attempt last year to privatize our forests from which once again the coalition backed down. 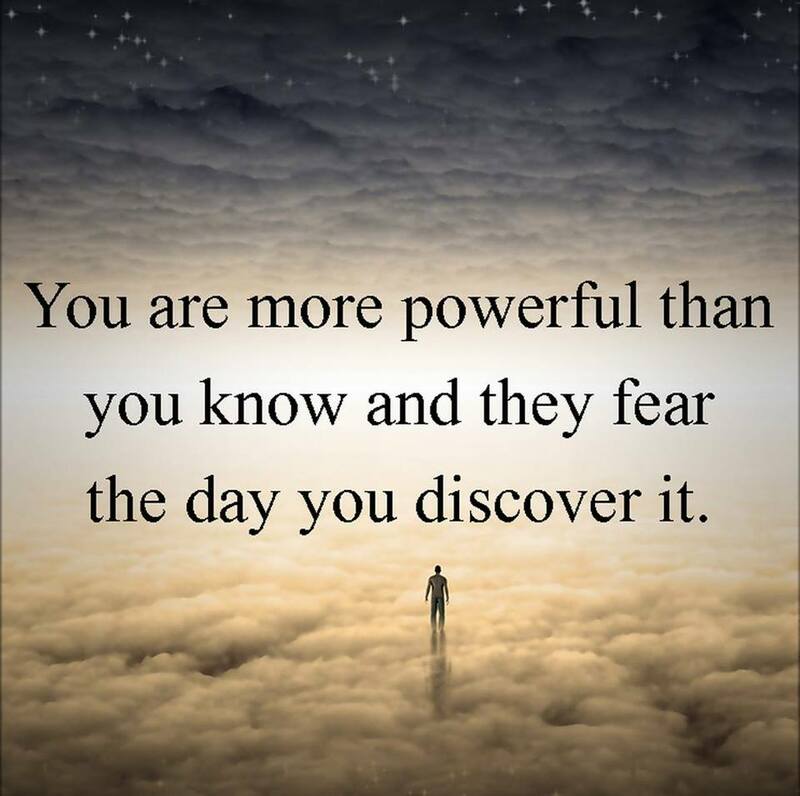 I doubt they have given up yet and now with more power than before it is even more likely they will try again.